In the perfect world, each team in our organisation would spend 100% of their time on improving products and delivering value to customers. Every second of every day would be spent producing value which increases customer satisfaction and the business’s bottom line. This perfect world does not exist due to the limited capacity of human cognition. No single person can have all the skills and knowledge needed of the business and of the technical solution. Collaboration is vital — we must sacrifice some of the time spent doing the work to understand what we should do. This idea of sacrificing productivity for collaboration is especially crucial at the multi-team level (Layer 2+ Capabilities). Ideally, all of our teams would be delivering at maximum speed and would all be heading in the same direction, highly-aligned with business goals. Unfortunately, we need to balance speed and alignment, and how we make this trade-off is not clear because not all alignment has the same cost. The cost of keeping multiple teams in one organisation aligned may be different to the costs of keeping multiple teams in another organisation aligned. How do you know what is the right balance for you? 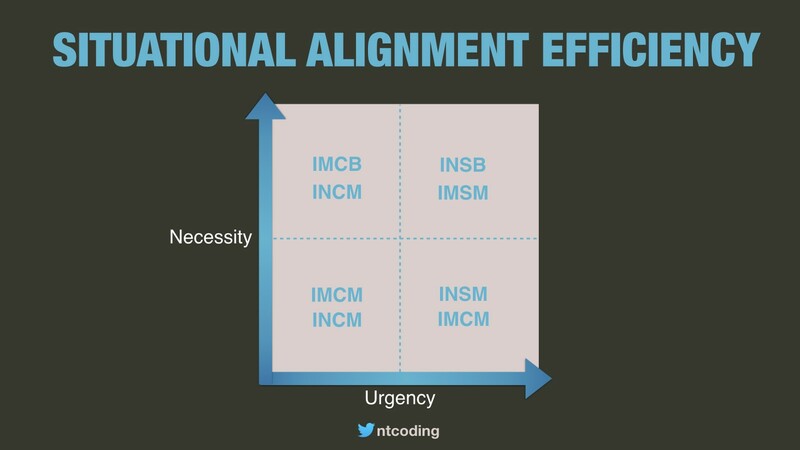 To address this challenge, I’d like to introduce you to the concept of Alignment Efficiency. I’ll show you some example scenarios to help you understand this concept, and I’ll demonstrate sociotechnical architecture patterns you can apply in your organisation to optimise your alignment efficiency. Any Formula 1 fans reading will likely be familiar with aerodynamic efficiency — adding more downforce to a car so it corners faster while minimising additional drag which reduces speed on straights. Alignment Efficiency is inspired by aerodynamic efficiency. Earlier this decade, Henrik Kniberg defined a concept — Aligned Autonomy — which resonated heavily with so many people. His articles, his talks, and his sublime visualisations have been referenced thousands of times. “Alignment Enables Autonomy”. This is the essence of Aligned Autonomy, and it makes complete sense. If there are high levels of transparency, and all teams are aligned to the same goals, and every team knows what every other team is working on, every person will be making day-to-day decisions aligned with what is best for their team and the organisation as a whole. For some teams in some organisations, the cost of achieving alignment could be 0.5% of their time. For every minute the team spends on aligning themselves with other teams, they get 199 minutes of productivity. However, for some other teams in the same or different organisations, they may spend 20% of their time achieving alignment. It’s not uncommon for a team to be involved in two hours of cross-team collaboration per-week. Now we get to the interesting question: for a given team in a given organisation, what is the optimal alignment efficiency? How much of their time should they sacrifice to aligning with other teams instead of churning through their backlog to deliver enhancements for customers? To answer these questions, we need to understand the different types of alignment and their efficiency characteristics. 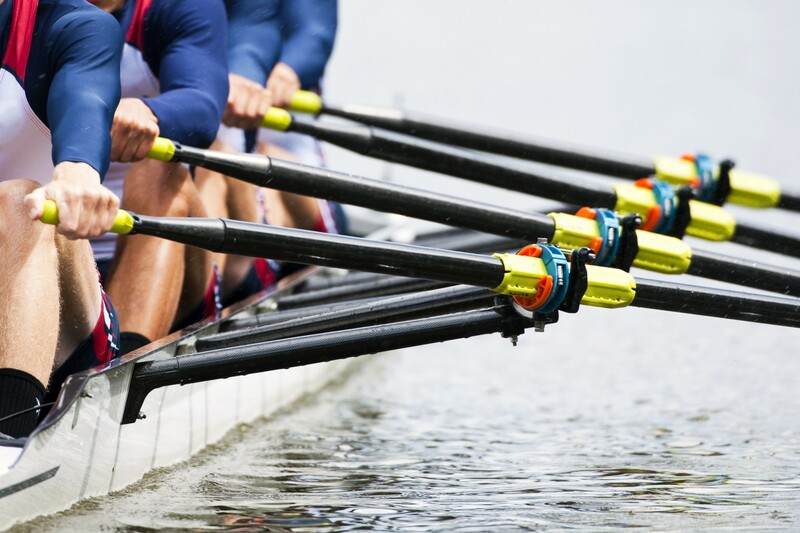 Alignment can be interactive; teams engage to collectively define how they will work together. Or alignment can be imposed; one team will dictate the terms and others will follow. Alignment can be synchronised; all recipients receive the information at the same time. Or alignment can be choreographed; recipients receive and act on the information at a later time. Alignment can be broadcast; information is transmitted from one sender to many recipients. Or alignment can be transmitted via a messenger who may filter the information for the target audience. Can you see trade-offs emerging? Interactive-Synchronised-Broadcast (INSB) alignment could be a meeting involving two teams discussing how they will work together for the next sprint. The meeting is synchronised because all are in the same place at the same time. It’s interactive because information is flowing in both directions. And it’s broadcast because all recipients are receiving the unfiltered information. INSB alignment ensures minimum variance from the optimal path. The ideal path forward is achieved at the earliest opportunity and everybody is immediately aligned with it. When the information is essential to alignment and is urgently required to be acted upon, INSB alignment is ideal. But it comes with the overheads of having to find a time where everybody can be present and not working. If information is less essential and does not require immediate processing to avoid teams becoming unaligned, the overheads of INSB alignment can be inefficient. Imposed-Choreographed-Messenger (IMCM) alignment can be more efficient without compromising effectiveness. For example, one team can notify other teams via email they are planning to release a new API. One person from each team (the messenger) will review the information and pass on a distilled version of the message to the rest of their team. Which information is necessary for alignment and in what timeframe? Which type of alignment is the most efficient for communicating the necessary information in the required timeframe? Ordinarily, we should strive for absolutely-high alignment efficiency. Our goal should be autonomous teams working uninterrupted toward clear goals. I’ll now show you four contrary scenarios, where a lower alignment efficiency is the right choice. Where are the boundaries in the system and which team will own which pieces? Initially, alignment will require higher synchronisation and volumes of information. However, as these three elements continue to evolve and mature, they become the foundations enabling highly-efficient aligned autonomy. The boundaries are more stable and the principles and standards are established: less information needs to flow to keep teams aligned and it will be communicated with minimal overhead thanks to the established principles and standards. 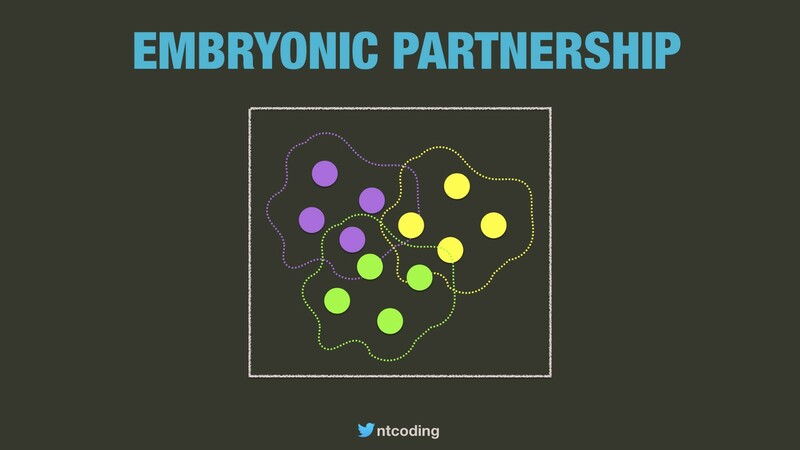 This sociotechnical architecture pattern is the Embryonic Partnership: multiple new teams working on related parts of a system, growing into autonomous, alignment-efficient teams. In large organisations with established teams, sometimes it is necessary to increase alignment at the cost of reduced alignment efficiency. An example is a specific project or programme of work cutting across multiple teams requiring frequent and immediate collaboration. Examples of this scenario including building a new mobile app in a digital platform ecosystem, forming a temporary-team to implement GDPR, or establishing a temporary DevOps team. Rather than trying to have multiple teams all stay highly and immediately aligned with each other, greatly reducing alignment efficiency, a Strategic Alliance Team can increase alignment efficiency by reducing the number of people who need to remain synchronised. Another scenario in which we reduce alignment efficiency in established organisations is when the business wishes to explore innovative new product offerings which cut across existing technical components owned by multiple teams. When attempting to explore innovation opportunities, the need for urgent alignment is greater. Since the path ahead is unknown, synchronised alignment is needed to keep everyone moving in the same constantly-changing direction. When the new innovation requires functionality and data from existing products and services, one approach is for the new innovation to be partially owned by each team which the new product cuts across. However, this approach then requires multiple teams to be highly-aligned with high levels of synchronisation. Alignment will be slow as will be the speed of innovation on the new product. 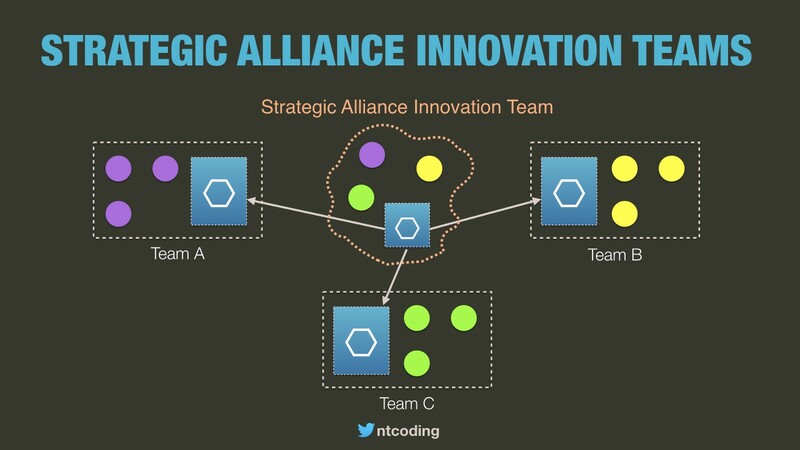 Instead, we can look at the Strategic Alliance Innovation Team pattern. A Strategic Alliance Innovation Team is a temporary, cross-functional team. The pattern is a more specific version of the the Strategic Alliance Team pattern. In this case, the goal is to validate an innovation opportunity and technically the team is likely to be building new technical components rather than just modifying existing components. Even in established organisations, the vision of highly-autonomous teams iterating at a high-speed with high alignment efficiency cannot always be realised. We’re all familiar with the most common reason: multiple teams all having to work within monolithic, Big Ball of Mud, legacy systems. I’ve worked with a few organisations who tried an overnight transition to highly-independent teams, all working in the same legacy codebase. On each occasion the results were terrible, causing massive friction between multiple teams all trying to move fast in different direction with their ankles tied together. I refer to this pattern as the Begrudging Partnership. 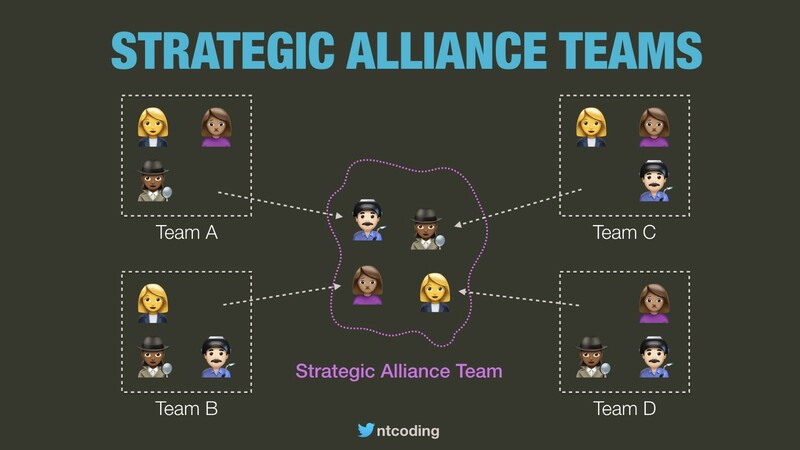 Multiple teams who must work very closely together even though they really don’t want to or have any reason to if not for the organisational coupling necessitated by the technical coupling in the code. A begrudging partnership necessitates low alignment efficiency. 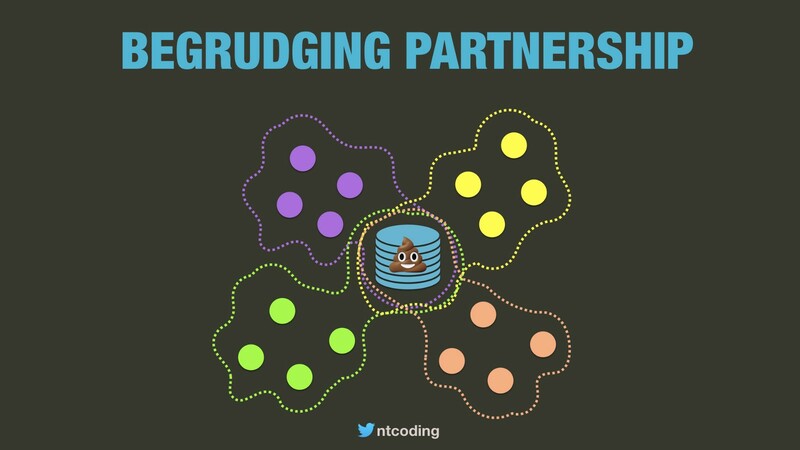 It is hard to avoid planning ahead in order to understand which teams will be touching which parts of the codebase, as-well-as coordinating merging, testing, and releasing. Without this planning, you are pitting teams against each other. For each of the scenarios and patterns presented, the longer-term view is a transition to highly-autonomous teams with greatly-improved alignment efficiency. How to transition is a different topic and the options will vary based on the pattern. A heuristics-based approach is needed. To get you started, you can find a collection of heuristics on my site.